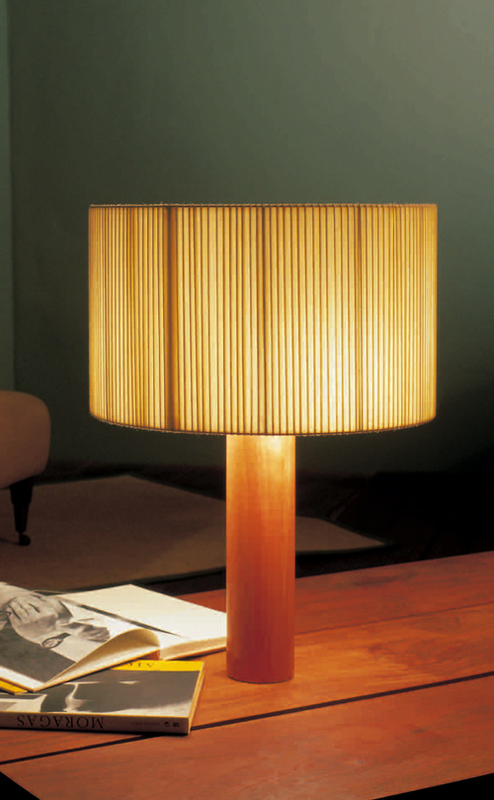 Santa & Cole: Antoni De Moragas: Moragas Table Lamp, imported from Europe. A timeless table lamp that is a beacon of modern design, the Moragas captures the pragmatic temperament of one of Spain's great philosophers of form. A central column of wood supports a generous circular shade of bookbinding tape, that provides a relaxing combination of light and shadow. The Moragas table lamp was designed in 1957 for the reception area of the then new offices of the Catalan Architects' Association. The Moragas lamp is an extraordinary example of the balance of forms and proportions, yet it is a downright contradiction: a particularly small cylinder of wood supports a shade five times its size. The three light bulbs provide a powerful, well-distributed source of light. The cylindrical wooden base is topped off by a brass cap that covers the wiring and a central solid brass nut to support the light bulbs. The shade also screws on to this support. The unusual shade is made of bookbinding tape. Because the ends of the tape are thicker, they create eloquent strips of light. Moreover, they heighten the impression of verticality in what is essentially a wide, round shade. In the first version of this lamp a raffia shade was used but this was replaced by the bookbinding tape in a subtle allusion to tradition. It is said that Moragas had this lamp on his desk and that he used the spaces between the tape to hold calling cards and memos to himself. Moragas was a daring, rebellious architect, promoter of modern people-friendly architecture. He was heavily influenced by Alvar Aalto and the rational-organic forms of Scandinavian architecture. He attempted to restore objects with the symbolism lost in the consumer society's obsession with vulgar materialism. He dedicated all his efforts to reconciling humanity with architecture and the design of his time. Size Lamp: 24.5" overall height, 3.5" diameter base. Bulb: 3 x 40W with dimmer. Usually ships in 2-8 business days or sooner.